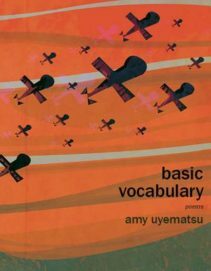 A contributor to the pioneering 1971 anthology Roots: An Asian-American Reader, Amy Uyematsu published four books of poetry before her latest, Basic Vocabulary. In her first two books of poetry she breaks through silence to write powerful personal story poems about her parents and grandparents interned at Gila and Manzanar during World War II, and about the U.S. wars in Asia in the 1960s. She constructs her own bilingual language and reality when she writes about striving for Japanese-American cool as a teenager and the elegance of geishas in an Utagawa print, or when she brilliantly describes burning and hope during the Los Angeles 1992 riots in “The Ten Million Flames of Los Angeles.” A longtime math teacher, she’s also one of our few math poets. In the book’s second section, “When the Numbers Don’t Add Up,” the war outside the nation bleeds into the war within when Uyematsu hauntingly describes how a student of hers was killed over a Sony Walkman. Other poems such as “Graduation” give numbers that sadly describe many students, as two boys sign up for the Marines while most “memorize the prices / of the latest Nikes.” “Found Poem: Echoes from Zuccotti Park” offers a brief moment of hope in the global occupations, but the next few poems relentlessly provide more dispiriting numbers of drones used, citizens homeless, and black men killed. In the last section of Basic Vocabulary, “Mysteries, Medical and Celestial,” the poet faces head-on a second bout with cancer. Uyematsu especially shows great courage in a series of meditations on her radiation treatments; in “Zap #30” she gratefully acknowledges how “blessings arrive / in orchids and cards / the lighting of candles / a homecooked meal.” Other poems delve into more cosmic matters; “Three Quick Studies of Math Art” explores a photo of electrons in her body, a Persian mathematician’s seven-pointed stars, and a labyrinth. The final poem leaves us with hope as Uyematsu identifies infinity as feminine and glories in being a woman who embraces love and wonder. This entry was posted in Uncategorized and tagged Summer 2017 on August 3, 2017 by Kelly.